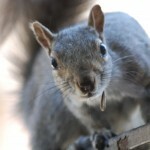 Bronx Council for Environmental Quality » Blog Archive » Squirrel at Crotona. This post was submitted by Martin Woess. I love all four of yours, but of course I had to choose this one for my comment, because it’s a critter. How long a lens were you using? I love this shot. I think the little guy knows he is Calendar pin-up material and is very happy to stop and pose for a shot. Good work! Gotta love the inquisitiveness of these creatures. Love the inquisitive look on his face! What a great shot! He really does want to know what you’re doing, doesn’t he? Great close-up! However it would’ve been nice tohave some local Bronx scenery sharing the picturespace. I mean, this pic could have been taken in Central Park and who’d ever know? However it would’ve been nice to have some local Bronx scenery sharing the picturespace. I mean, this pic could have been taken in Central Park and who’d ever know? Bravo Martin! Great close up.